Ibogaine received concerted attention for its addiction treatment and other properties at a recent conference in Boston. Here's a report. On a cold and clear Presidents Day weekend, dozens of treatment professionals, underground providers, patients, researchers and entheogenic enthusiasts gathered at Boston's Northeastern University for the Boston Ibogaine Forum , the 2009 installment of the annual ibogaine conference, sponsored the Northeastern Students for Sensible Drug Policy  (which is also hosting the Northeast SSDP Regional conference  on April 3-5), the National AIDS Brigade , and Cures Not Wars . Ibogaine  is considered the 'active' compound in the Tabernanthe iboga plant, used for centuries as a healer, teacher, and catalyst for ceremonies by the Bwiti people indigenous to what is now the Central-west African republic of Gabon. But the versatile plant has remained virtually unknown in the West, where it has a very different history. Researcher Howard Lotsof, PhD, addicted to heroin and methadone, discovered the anti-addictive action of ibogaine in 1962. Given a capsule of pure ibogaine HCL by a trusted friend who was familiar with chemistry, Lotsof was simply seeking a new high. He was astonished when coming out of this difficult experience 36-opiate-abstinent hours later to realize he had no physical craving for opiates, and even more remarkably, had experienced very little of the agonizing physical symptoms normally associated with opiate withdrawal. Although other early research was undertaken in the 1960s, ibogaine's eventual acceptance as anti-addiction agent in the West was tied to Lotsof's remarkable personal story. Off opiates, Lotsof turned with enthusiasm toward ibogaine and other psychedelics, running trials in the mid-1960s before going to prison under new federal drug laws banning the psychedelics at the end of the decade. For another two decades, Lotsof and ibogaine as addiction treatment wandered in the wilderness, his research supported by groups such as Cures Not Wars. It was only in 1989 that Lotsof made significant contacts with mainstream researchers, who undertook their own pioneering researches. In the years between then and now, thanks to the missionary efforts of Lotsof and his supporters, ibogaine has ever so slowly become of greater and greater interest to addiction researchers and others. Valentine's Day morning found ibogaine aficionados at the movies for Facing the Habit , a 2007 film featuring heroin users who succeed -- or fail -- to kick their habit through ibogaine treatments. Next up was ibogaine's most prominent advocate, the mustachioed Cures not Wars co-founder and Yippie! Dana Beal, who brought conference attendees up to speed on the latest research on ibogaine's anti-addictive properties, including its ability to regenerate dopamine pathways in the brain through its activation of glial cell line-derived neurotrophic factor GDNF. This exciting research had a panel of its own later in the day featuring Roman Paskulin, founder and director of Slovenia's Open Mind Institute  and Dr. Tracy Blevins. 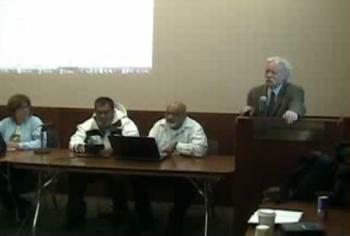 Beal was followed by a panel of ibogaine treatment providers discussing the special safety challenges involved in treating multiple addictions to different drugs, including Drs. Anwar Jeewa and A.R. Gani, of the groundbreaking residential treatment center Minds Alive  in Durban, South Africa, Dr. Bruno Rasmussin of Brazil, and long-time provider Rocky Caravelli. Next up was one of the most interesting presentations of the conference, by Justin Kirkland, Vice President of Sales and Marketing for Obiter Research  on the company's efforts to develop more cost-effective methods of synthesizing 18 Methoxycorinaridine 18-MC, an ibogaine analog with fewer side effects and greater potential for treating methamphetamine and nicotine dependence. The day's events closed with McLean Hospital's Dr. Carl Anderson  discussing ibogaine, dream states and fetal R.E.M. Sunday started with another ibogaine documentary, the Dutch Rites of Passage , followed by SSDP Northeastern's Arielle Torra presenting on the subjective experiences of patients treated at Dr. Deborah Mash's Healing Transitions Institute for Addiction  clinic on St. Kitts. The first scheduled panel of the day addressed the controversial use of ibogaine for other indications, including hepatitis C (HCV). Former New Mexico Department of Health Harm Reduction Coordinator Phillip Fiuty and Rocky Caravelli confirmed the existence of HCV patients whose conditions have improved and even cleared the virus without interferon treatment. Caravelli also described positive effects on herpes, MS and asthma. Jason Farrell, founder and former executive director of Positive Health Project  and currently CEO of Harm Reduction Consulting Services, Inc., suggested a collaborative study by clinics in South Africa, Mexico and Brazil tracking the viral loads of HIV/HCV patients for six months to a year. Next, former High Times and drugwar.com  writer and editor Preston Peet gave dramatic personal testimony on ibogaine's efficacy in managing chronic pain by drastically cutting opioid tolerance. The liveliest panel of the conference came up next, featuring Patrick Kroupa -- a pioneer hacker and long-time activist whose multiple roles include High Priest of the Sacrament of Transition , an Eastern European based iboga religion -- Dr. Deborah Mash, Peet, and Lenny of the New York City ibogaine support group comparing ibogaine to more conventional treatments, such as 12-step cold turkey, methadone taper, buprenorphine and ultra-rapid opiate detox (UROD). UROD -- the direct injection of the opiate blocker naltrexone under benzodiazepine sedation -- was denounced by all panelists as ineffective and inhumane. The next panel, comparing the anti-addictive effects of ibogaine to other entheogens, featured Harvard Assistant Professor of Psychiatry John H. Halpern  and Jon Harrison, the principal investigator for the Multidisciplinary Association for Psychedelic Studies  ibogaine outcome study at Pangea Biomedics  in Playas de Tijuana, Mexico. Halpern compared ibogaine's effectiveness to other entheogens sometimes given as treatment modalities for drug addiction, most notably peyote use in the possible treatment of alcoholism among the Native American population, and the sacramental use of ayahuasca among American members of the Santo Daime and UDV churches. This observational case study is examining changes in substance use in 30 individuals seeking ibogaine-based addiction treatment, and is intended to gather information to evaluate whether ibogaine-assisted therapy helps opiate-dependent people stop using opiates or practice moderated use after the therapy. Twelve-month follow-up data is being collected from participants in the study to examine whether ibogaine-assisted therapy facilitates improvements in quality of life that result in decreased harms associated with chronic or mismanaged opiate use. The study has received Institutional Review Board approval from the California Institute of Integral Studies  and has enrolled 11 of the 30 subjects. For many months, MAPS had no success in raising funds for the study, but received its first significant donation at the conference, and by March 2nd, had raised all the funds for the study. Halpern, who's published some of the only research on peyote use by Native Americans, surprised the crowd by revealing that the National Institute on Drug Abuse  had so constrained his research that he wasn't allowed to directly study peyote's manifest anti-addictive effects. He also had no data on receptor-mediated anti-addictive effects, ascribing it all to "psychedelic glow." Sunday's program closed with Makky, Boston University Professor of Classical Studies Carl Ruck  and Beal discussing shamanic scenes in South America vs. Africa, a possible iboga role in the ancient world, and the dangers of "The Mushroom and the Cross" approach offending fundamentalists, respectively. Presidents Day opened with a roundup of the international ibogaine scene. Venezuelan Drs. Rosaria Dávalos and Zulema Medrano described great progress in promoting ibogaine treatments, but also obstacles due to continued deference to the US. Drs. Jeewa and Gani gave details on their residential treatment center. Australian treatment provider Jason Chamon described a smaller, informal treatment scene -- clandestine in Australia, legal in New Zealand. De Loenen finished up, appearing live via Skype to contrast the more relaxed attitudes in Spain and Portugal with a forum in Holland on arrhythmia in ibogaine patients. The international ibogainesters were followed by a panel on ibogaine's role in harm reduction, featuring Jason Farrell, Phil Fiuty and Cures not Wars cofounder and veteran drug policy activist Doug Greene. Farrell stressed the need for ibogaine treatment providers to be careful about whom they treat to minimize risks, citing a recent case in Netherlands where a patient refused to stop alcohol use before a treatment and had a seizure and then two days of arrythmia. At the same time, he urged greater availability of ibogaine treatment, advising potential providers to get a space and cots and "just do it." Greene praised ibogaine as the most libertarian option for drug treatment, and called on the drug policy reform movement to center its efforts on marijuana and ibogaine. The conference closed with a panel that included the National AIDS Brigade's Jon Stuen-Parker discussing his lawsuit  against the federal government for inattention to crack and heroin. MAPS founder and President Rick Doblin then gave the attendees a road map to promote ibogaine to state and federal policymakers, while Dana Beal suggested a letter from members of Congress to President Obama's forthcoming DEA Administrator. This was the first ibogaine conference to be streamed live on the Internet, with twice as many people often logged-on as were in the room. Although speakers and attendees alike were frustrated by the conference's uneven pacing and complete disregard of the announced, reaction to the content of the conference was generally positive. Jason Farrell said: "It was a very impressive conference that opened my eyes to the serious, international work that's being done on ibogaine. It's unfortunate that it didn't get the news coverage it deserved." Long-time drug policy reform activist Valerie Vande Panne said: "It's good to see ibogaine getting the research and recognition it deserves. Clearly, it has been beneficial in a holistic, dignified, and humane way to the lives of many who considered themselves addicts ready for a life change." Rick Doblin said: "Many of the speakers were fascinating and had lots of experience and important information to share, and the future of ibogaine is bright. The clinics are moving toward more of an above-ground, responsible medical model and are realizing the importance of aftercare programs. I'm not sure where resources would come from for clinical studies to make ibogaine legal in the US -- that may be a stretch too far for NIDA, even under Obama. While I don't see commercial drug development happening in the near term in the US, or anywhere else, there will be more prospective research at the clinics which will, over time, build support for more clinical studies." Streaming video of the conference can be found here .